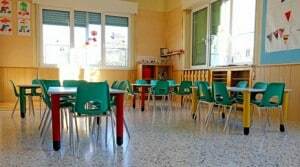 Although there are many resources available to assist in understanding what the best practices are for cleaning childcare facilities, there are no official government standards. Whether you have a cleaning service clean a childcare facility or internal staff take on the responsibility, it has to be a team effort to ensure the facility is not only clean, but sanitized and disinfected routinely. All employees and cleaning staff should be trained regarding the basics of how the childcare facility should be cleaned. The difference between cleaning, sanitizing and disinfecting is related to how you’re removing contaminants. Cleaning generally uses products to physically remove dirt and some contamination. It’s effective and does remove most germs, especially if you use the product or dilute it using hot water. Many areas should be cleaned daily or after using the surface. This includes countertops and food preparation appliances after each use. Vacuum rugs and mop floors when children aren’t present. Sanitizing reduces germs on surfaces and should also be done before and after each use of some surfaces and equipment in a childcare facility, but it doesn’t kill bacteria or fungi as effectively as disinfecting. They do allow surfaces to be sanitized to levels that adhere to standards by most public health regulation agencies. Disinfectants destroy a variety of germs and viruses on surfaces. The NAEYC suggests disinfecting some areas after each use or on a daily basis. Because disinfectants don’t kill bacterial spores, it’s an important task to be done on a routine basis in different areas of the facility. Read the label of sanitizing and disinfecting product to ensure they’re EPA registered to do the job properly. Even if you use an expert contractor to provide cleaning services when the facility is closed, your employees will have to do some cleaning during the day. They don’t have to be experts, but provide them with some training related to how often specific surfaces should be cleaned during the day, and what type of cleaning products should be used. If you provide an orientation session to your new employees, take about 15 minutes to discuss cleaning. Because many childcare facilities open early and close late, it’s rare to have the opportunity to gather all of the employees together for training, but there’s other simple ways to assist employees in cleaning, sanitizing and disinfecting properly and when it’s required. For cleaning tasks that should be done by employees, find an easy labeling system for your cleaning products. The labeling can be as simple as using a different colored label for cleaning, sanitizing and disinfecting products. Also provide dilution ratios for each product to ensure employees are using the proper amount of cleaning products. Also provide “easy to use” cleaning equipment and tools. To give examples, a smaller bucket and mop used in households can clean, sanitize or disinfect small messes that require cleaning immediately without getting out the heavy and cumbersome equipment used to clean large areas. After using the small mop bucket and mop, disinfect it quickly by soaking it in a disinfectant and hot water if the disinfectant requires dilution. Rinse the mop and mop bucket afterwards so it’s ready to be used again. Provide enough clean, lint-free or microfiber rags to use over the course of one or two days, then launder them to prepare for the next few days. Not only are these products inexpensive, it allows your employees to get the job done quickly and efficiently, then get back to caring for the children. Organizations, such as the National Association for the Education of Young Children (NAEYC) suggest regarding how often childcare facilities, the equipment used to care for children and toys should be cleaned sanitized or disinfected. You can make a quick and easily readable list for employees to review on what and how to clean each area of the facility. One of the best and cheapest products to use to sanitize and disinfect is bleach, but should be used with caution, especially in a childcare facility. Ensure the bleach product is EPA registered before purchasing it. Read the instructions regarding dilution and use bleach with caution. While using bleach, make sure the area is well ventilated. If you use bleach on surfaces or floors while children are in the facility, rinse and dry the areas immediately. Green products are recommended in childcare facilities for surfaces that only require cleaning, because they don’t cause as much harm to human health and the environment. No green products are regulated by government agencies, so select those types of products carefully. Keep in mind that children are much more susceptible to illness and potential hazards from certain cleaning products. Always inform parents about what products you use to clean, sanitize and disinfect, as well as any potential health concerns that their children may have. If you change products or cleaning routines, inform parents and allow them to contact you if they have any concerns. This entry was posted in Carpet, Dishwashing, Disinfectants, Floor Care, General Cleaning, Green Cleaning Products and tagged apple ease dishwash, kitchen cleaner, Pine Disinfectant, Pure Bright Bleach 10%, Spray Disinfectant/Deodorant Cleaner. Bookmark the permalink.